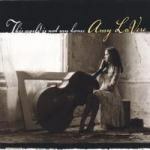 With the new year barely upon us, Amy LaVere's already released one of the albums of 2006. No, honestly. Amy LaVere is another of your typical 21st century renaissance women. Actress by day, singer and musician by night, LaVere's been a Detroit punk, learned to play rockabilly stand-up bass in Nashville, fronted her own band in Memphis, worked as a tour guide at Sun Records, and played Wanda Jackson in Walk the Line. Now, even as she's being cast to appear alongside Samuel L. Jackson, Christina Ricci and Justin Timberlake in Black Snake Moan (it sounds awful, frankly), she still finds time to release her debut solo album. Busy, busy, busy. This World Is Not My Home is an impressive collection of slightly quirky, vaguely cinematic, and deeply interesting songs that brings together elements of blues, jazz and country into an often dark but generally compelling work. Or to put it another way, Amy LaVere's a little bit Jolie Holland -- but more indie and less precious -- and a little bit Kasey Chambers -- but less Australian. And her debut album is good enough to merit a track-by-track description. The song that opens This World Is Not My Home, "Day Like Any", could be LaVere's audition for Tarantino. Marinaded in a slowly sauntering Latin dance rhythm, gilded with Jim Mathus' guitar, and sung in a quite beautiful smoky style, "Day Like Any" is the number that will be playing in a rundown badlands bar as Steve Buscemi stares into a bottle before shooting the breeze with an out-of-place, over-dressed Lucy Liu; and Amy LaVere will be the pale-skinned beauty singing out her heart in the corner as she caresses her stand-up bass and conceals an automatic weapon taped to its reverse. The songs that follow slowly stretch LaVere and her colleagues. "Nightingale", written by ex-Squirrel Nut Zipper, Mathus, adds the irresistible plaintive moan of pedal steel. "Leaving" takes that pedal steel and runs with it, accentuating the positively country elements in LaVere's background into a classic old school song of honky tonk heartbreak. And then "Never Been Sadder" turns the same gothic sorrow into something entirely more syncopated and jazzy. At this stage of my relationship with Amy LaVere, "Innocent Girl" is my favorite of all her songs. Built on a steady foundation of persistent but never pressing strumming, it showcases the little girl lost fragility in her voice; and those few moments when her voice all but breaks just so across the gaps in the rhythm reveal she has the ability to take away the breath of even the strongest men. "Take 'Em Or Leave 'Em" recalls Lucinda William's "Crescent City" in exactly the same way that "Innocent Girl" whispers Mazzy Star. The actual similarities are few, and yet the connection is made and neither party is insulted or flattered by the comparison. "Last Night" returns to a more explicitly country vibe -- "I'm not much of a fighter, but I'll fight her for what's mine" -- but throws in just enough musical variety to keep you guessing, while "Set It Down" adopts a melodramatic blues theme. The title track, "This World Is Not My Home", is LaVere's most Jolie-esque moment; its melodies and rhythms, and LaVere's performance all strongly recall the best of Ms Holland's "Escondida". The final piece, "We Went Sailing", has a casual, almost throwaway, sparse country blues thing going on, with extra added ukulele, that brings this noteworthy album to a pleasantly relaxed closure. By spurning the big finish, LaVere contrives to make less achieve more. At just over 35 minutes, This World Is Not My Home is slight, but never insubstantial. Amy LaVere has an intriguing and undeniable talent, and with the new year barely upon us, she's already released one of the best albums of 2006. No, honestly.